Casey, Shadow and April are at the farmhouse in Northampton, Massachusetts. Jones came back to pick up some items that he wants, and the pair set about cleaning up a little. April heats a bottle for Shadow and finds one of Casey’s favorite mugs. Later that evening, after dinner the two reflect on their past. “Well, there is one difference.” April notes as she gets up and walks over to Casey. “What’s that?” Jones asks. April then plants a kiss on his surprised lips. “I’ll do the dishes!” Casey beams. Jones starts washing up and finds one of Leo’s Aikuchi knives. He shows the blade to April. “I wonder where they are now…” Casey ponders. The next morning, April is swimming in the lake. As she treads water, something pulls her under. Casey springs into action, but before he dives in, April is pushed out of the water by 3 sets of green hands. Leo, Mike and Raph emerge from the lake with April in tow, Mikey lending an arm to her as the group makes its way to land. Casey gives everyone a hug, except Raph, who he throws a punch at (much to Raph’s delight). The group relaxes on the grass and catch up with everything that’s transpired over the previous months. April announces that she’s definitely buying Casey’s mom’s apartment building and she’ll be sharing it with Casey and Shadow. Mikey hits it off with Shadow. April asks where Donatello is and Leo explains that he’s with Master Splinter. The friends hike out to the woods and find Master Splinter and Don in a cave. Stories are exchanged. “You’re sure about this, Don?” Leo inquires. “Yeah… I need some time to… reflect on everything’s that happened… my mind and body need recuperative time… and Splinter has agreed to help me.” explains Donatello. 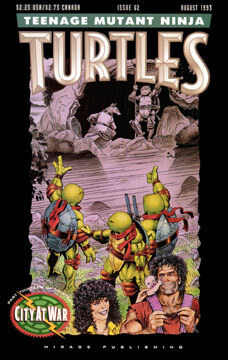 “Donatello’s decision… he has made it.” Splinter states. “Yes, Master Splinter… as you wish.” Leonardo bows. April tells Don and Splinter to stay at Casey’s farmhouse, something the mutants are hesitant to do, for fear of being discovered. As the group prepares to leave the cave, April pauses to say goodbye to Splinter, but he’s gone. April and Casey are visibly disappointed with this explanation, but they ask Donatello to tell Splinter goodbye for them. Then April, Casey and Shadow depart with Mike, Leo and Raph. As they reach the edge of the farm and leave the forest behind, April pauses once again. “Casey… can I have a few minutes alone?” she asks. “Sure, babe.” Casey assures her and walks off, leaving her at the edge of the woods. “I don’t know if you’re there, Splinter… if you hear me. If you can… I want you to know… my father died recently. My Dad — he raised me, taught me a lot about life, how to be a good person. I loved him. I still do. He’s gone now, but… the last few years, I’ve felt that I’ve had two fathers and… and… I’ve loved them both. Goodbye, Splinter.” April reveals through tears. From the depths of the forest, Splinter emerges and walks over to the crying woman. The two embrace as the rest of the family watches. Mr. Buscheyev is being taken by a cab to his new home. A man is accompanying him and carries his suitcase up the steps of the apartment building to his unit. The younger fellow opens the door and escorts Mr. Buscheyev inside, pointing out the various features and rooms. “Got any questions?” the young man asks. “No… thank you.” Mr. Buscheyev says. “The director, Mrs. Broderick, will come by today to introduce herself and to acquaint you with the facilities. I’ll be by next week to check up on you. Good luck, Mr. Buscheyev.” the young man explains as he exits the tidy apartment. Mr. Buscheyev turns on the TV on heads over to a window and looks out dejectedly, as the camera pans away from him.